The 200-foot Oliver Hazard Perry is America’s newest Tall Ship. She’s also Rhode Island’s Official Sailing Education Vessel, and I can’t wait to get aboard her! I have sailed on Oliver Hazard Perry Rhode Island’s voyages for two years in a row now. These were weeklong education-at-sea programs that took place aboard the Tall Ship Mystic, because the Perry was still under construction. This summer will be my third time to go, and it will be aboard the Tall Ship that everyone has waited for eight years to see completed and sailing. The reason why I keep coming back is because a passion has been instilled in me. I hope that one day I can be a crewmember instead of a trainee, and I’m really considering this as a future for myself. It’s incredible how quickly I came to love sailing when I first went to sea. That first trip, I met some really good people. We kept in touch afterwards and became the best of friends. 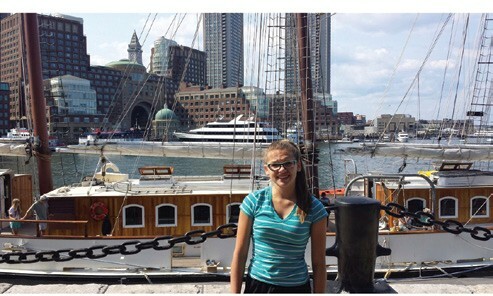 The author, shown here with the Mystic in Boston Harbor, sailed on the Oliver Hazard Perry for the first Teen Summer Voyage aboard the ship last month. Then, last summer we went on Mystic again. The memories I’ve created with all my friends will never be forgotten. Like how, on our first day at sea, we saw so many whales that by the second day when a trainee would shout “Whale!” no one was surprised anymore. (For all we knew, it could have been the same whales following us!) Or the time when we anchored at Buzzards Bay for a swim call. The water had minerals in it that made the water shimmer. They added this orange and purplish color to the ocean water, and it looked so pretty. The crewmembers were so helpful and amazing, too. They made sure we understood everything that was going on in every situation. They also made us feel very safe, but they reminded us constantly to be alert and to understand that anything can happen at any moment. Every year when I come home from the trip I feel as if I’m a new person. All in all, it’s an experience of a lifetime, and I hope more kids my age will get the opportunity to be part of this program like I have. I appreciate everything that Oliver Hazard Perry Rhode Island has done for me. They have truly given me a gift, and I’d never take that back for anything. 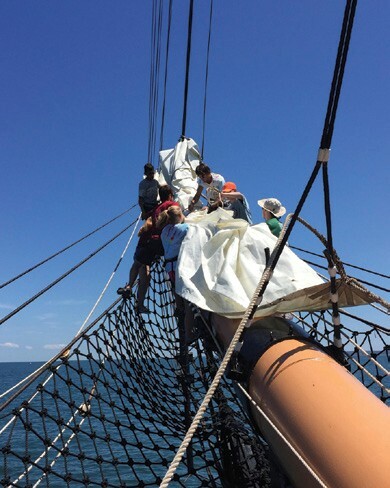 Editor’s note: Hannah, age 15, sailed aboard SSV Oliver Hazard Perry in August on a scholarship made possible through the Captain Wagner Honorary Scholarship Fund. Virginia Wagner, who lost her battle with mesothelioma in 2015, was a longtime student of sail training before she became a Tall Ship captain. Hannah passionately believes that those sail training experiences helped turn her life around, and that it can do the same for other young people. 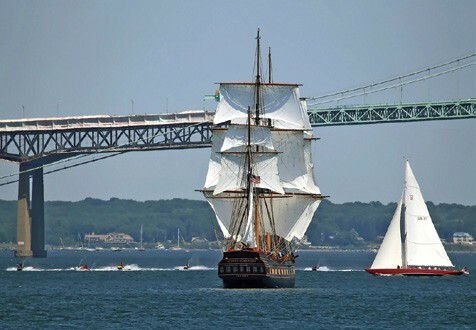 The mission of Oliver Hazard Perry Rhode Island, the non-profit organization responsible for the operation of SSV Oliver Hazard Perry, is to provide innovative and empowering education-at-sea programs to promote personal and professional growth. The programs are for mothers, fathers, teens and kids when educational partners are not using the ship. For more information, visit ohpri.org.